I’ve had a real thing about lentils lately. They never used to really feature in my day to day eating habits, but since including them in a few soup maker recipes I can’t get enough of them. They pack a real punch when it comes to protein and they are surprisingly filling. As you know, I like my recipes to be as simple as possible. I prefer short ingredient lists and minimal instructions! This recipe certainly fits this criteria, although you can add extra spices and herbs if you like. 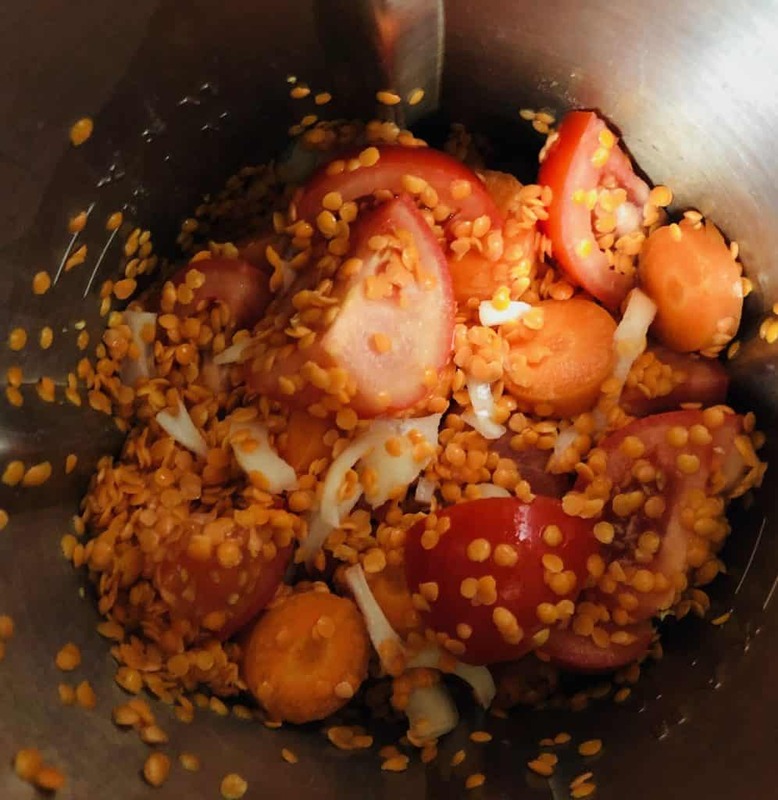 The ingredients are 1 onion, 1 garlic, 1 medium carrot, 100g red lentils, 6 fresh tomatoes and 800ml of veg stock. I make all my soups these days in a soup maker, but it can also be made in a pot on the stove. Just follow the same steps in the recipe below, but at the end you’ll need to use a hand blender to whizz it smooth. 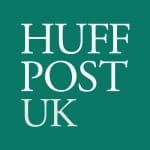 Side Note: If you don’t already have a soup maker and are tempted, check out my soup maker reviews. I do usually sauté at least the onions and garlic at the beginning, but on this occasion I just skipped that step and added all the ingredients at the same time. If you do want to sauté first just use an oil of your choice (I usually use olive oil or rapeseed oil), or a little butter. Then it’s just a case of chopping up your ingredients, rinsing the red lentils in cold water and then adding everything in. 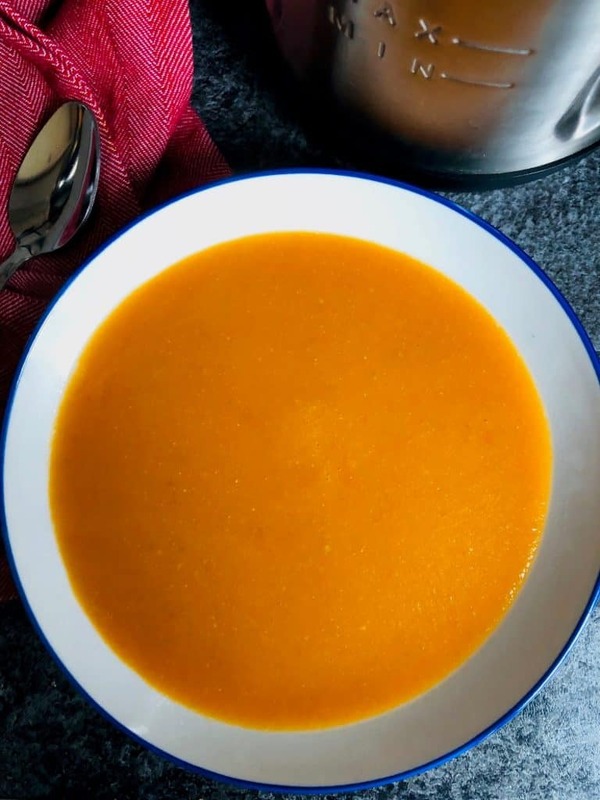 Make sure you give everything a really good stir before setting the soup maker off, this will ensure that no ingredients are stuck to the bottom or the side. If you feel like adding anything extra you can try adding some dried herbs or spices. If you would like to turn it into a creamy tomato and lentil soup just stir in some yoghurt or cream at the end. If you prefer a more intense tomato taste you could also add in a little tomato puree. Follow the same recipe but add in 1tbsp of curry paste or 1tsp of curry powder. 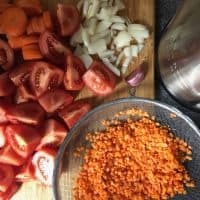 How Many Calories Are In Tomato And Lentil Soup? 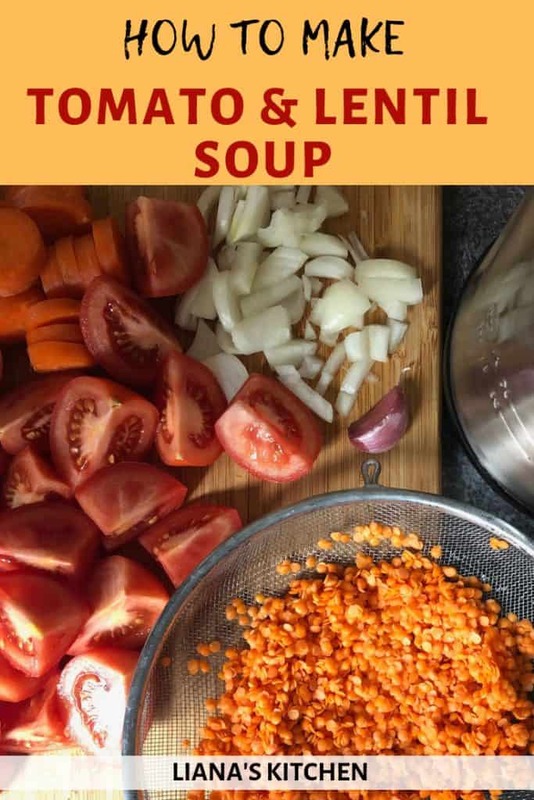 This particular tomato and lentil soup, without any sautéeing done at the beginning (so no oil or butter to include) comes in at just 80 calories per serving. The ideal slimming soup that will still fill you up! A filling, delicious and economical soup! 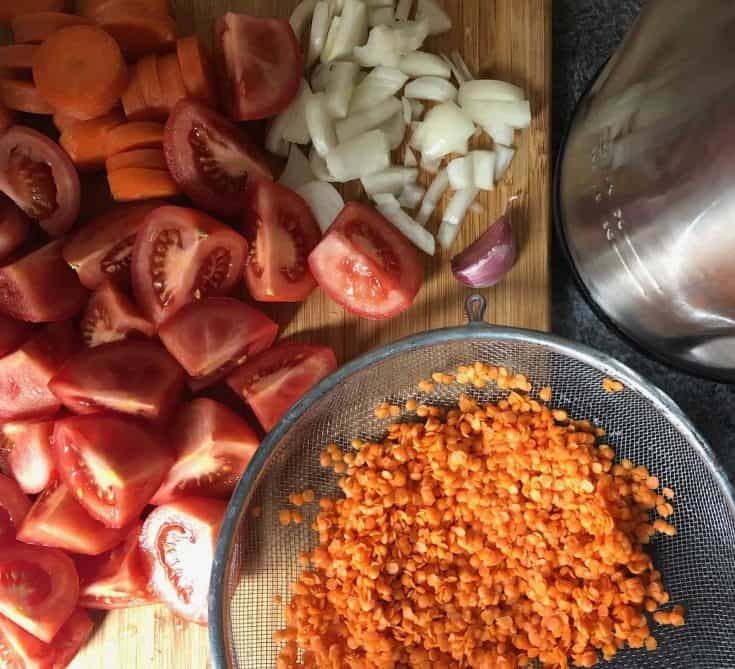 I love adding lentils to soup, this tomato and red lentil soup really ticks all the boxes on taste, simplicity and taste! You can saute the onions and garlic in a little oil if you wish, but I skipped this step. 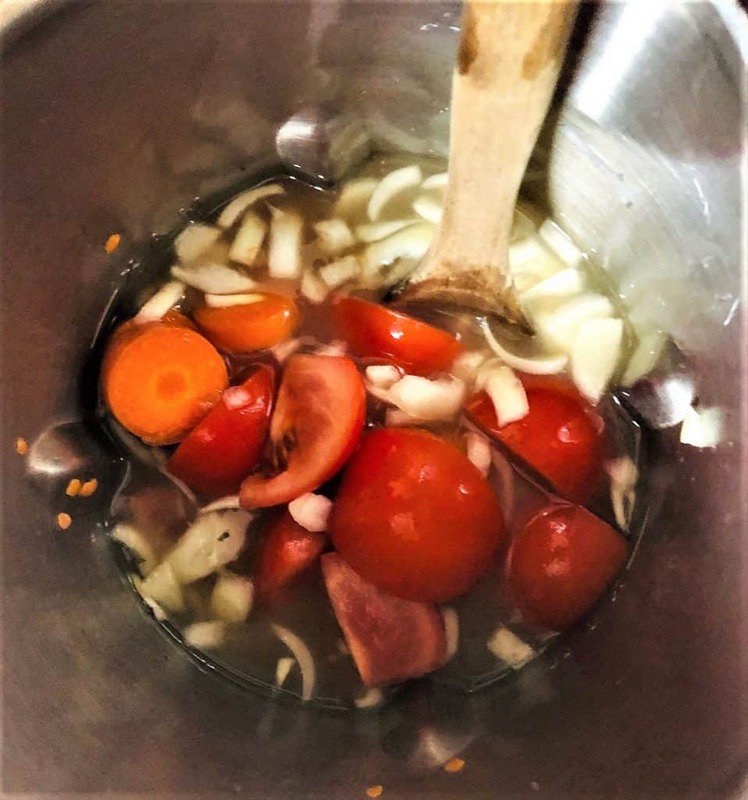 Add all the ingredients to the soup maker and make sure you give it a good stir round and ensure no ingredients are stuck to the bottom.